Turns out I didn’t have to go to the library this week! Some T.E.S. friends bought me a GINORMOUS bag of children’s books for my new office. Some are old favorites, but some are new to me and I’m excited to get started reading them. Stay tuned! For now, some great themed book selections, along with more summer reading tips and facts can be found at this Scholastic site. At T.E.S. we do not send home required summer reading but of course we expect students to be reading! There is so much time in each day – no school or homework and clubs/sports are mostly over – that fitting in a little reading will provide some nice down-time and intellectual stimulation. Research shows that students who do not read over the summer regress from where they left school in June and start off in September behind their peers. More on what parents can do to help prevent the summer slide can be found on the Scholastic website. 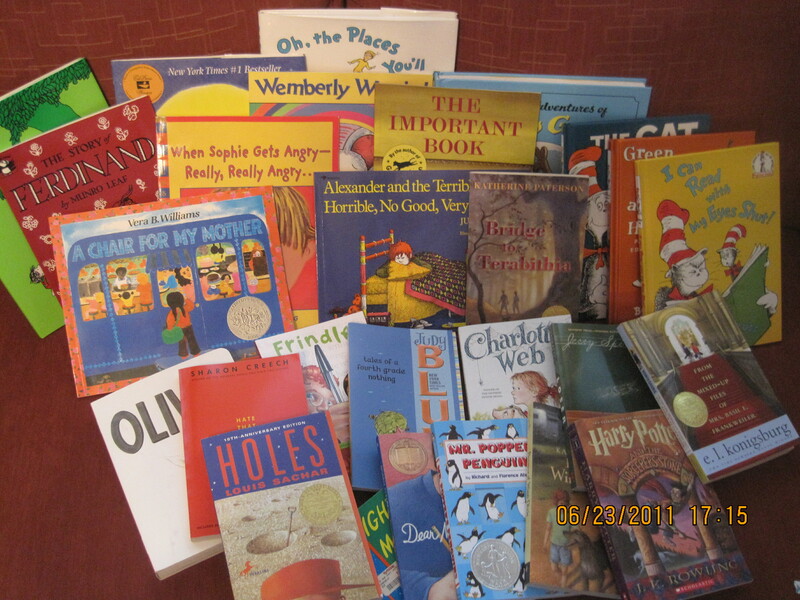 The library is an obvious place to start, and for my part I’m going to post all summer long about children’s books I’m reading – all from my public library. I hope you’ll read along! This is a copy of the email I sent out to parents today. It is with mixed emotions that I write this email to tell you that I will be leaving T.E.S. at the end of this school year. About a month ago, an open principal’s position in another district came to my attention. While not actively looking for a job, there were many compelling reasons to investigate further. Monday night, I accepted an offer to become principal of the Winthrop Elementary School in Melrose, MA. Winthrop is a K-5 neighborhood school with approximately 370 students, and 33 staff members. It is located next to the city where I was born and raised, and I feel (a bit) like I’m going home! As I write this email, my heart gets heavy at the thought of leaving our school community. I’ve always been supported by the people here, and love each and every one of our children. One of my favorite parts of each day is buses and morning drop off! Getting to know our students, from 3 months of age through fifth grade, has been the best part of my job, and I will miss them all. Thank you for your kindness and support of me over the past few years. I look forward to hearing about all the good that happens at T.E.S. in the future, and the paths our students take to success. I will always think of the people here, and my experiences, with fond memories.